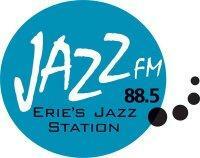 Jazz 88.5 FM celebrates three years with a free show for all of Erie. Three years ago, Mercyhurst College's WMCE became Erie's only full-time jazz station in Erie, providing locals with free entertainment. Now, 88.5 JAZZ FM thinks it's time to celebrate. Vinny Stefanelli hands me a poster with the words "Erie Jazz Jam" emblazoned across the top in blue before he begins his spiel about the station's upcoming Friday, Nov. 11 festivity. "This evening is to celebrate our third year of being Erie's lone jazz station," says Stefanelli, underwriting director at JAZZ FM. "It's quite an accomplishment to have an all-jazz station in Erie and survive. This is a way to expose jazz to people that don't know jazz and provide jazz to people that enjoy it." While he talks, I glance down at the handout. My eyes immediately notice a magical two-word phrase for highlighted in bright green. Stefanelli assures me that despite his hankering to bring in money to a station run on outside dollars, the Jazz Jam will act as a gift to the community. JAZZ FM's sign of gratitude will feature local bands, such as JD Jazz playing standards with several other local musicians and 2011 Rock Erie Music Award for Jazz winners Is What It Is from 6 to 9:30 p.m. Afterward, the reigns of the Jazz Jam will be handed off to some of Erie's best blues bands, with 2011 REMA Album of the Year award winner Ron Yarosz and the Vehicle set to take the stage until 1:30 a.m. While the number of full-time jazz stations in the nation continues to dwindle, Stefanelli beams when he informs me that JAZZ FM's listenership has actually quadrupled since they switched from a classical music format. Erie became a hub for jazz in the past when musicians would use the city as a rest stop between gigs, expanding the area's comprehension and appreciation for the genre as the performers churned out tuned between drinks. While the local talent encompasses a large range of ages and styles, JAZZ FM's presence helps bring in more outside influences as well. "It's huge. It's one of [a few] in the country," says Joe Dorris. "It really puts us on the map. Without the radio station, [acts] just come for a gig, but with the station, they can get more exposure as well." Dorris, half of JD Jazz with guitarist Frank Singer and volunteer coordinator of the Jazz Jam, says that he's been contacting several local bands to show off their skills in the upcoming event, in an effort to display the abundance of talent in the area. "There's a good music community in jazz," Dorris adds. "When you get into jazz you really get to stretch. This gives us a chance to bring jazz to Erie." Stefanelli knows his way around a fret board, so he understands Dorris' desire to bring the genre to others, even if he has a slight ulterior motive for the night. He wears a smirk on his face as he simply states both reasons for staging this event. "This is a chance to give back," Stefanelli says. "And I anticipate having a hell of a lot of fun." And I think that's something Erie can get pretty jazzed about.